Japanese Prime Minister Shinzo Abe has pledged $2.5bn (£1.7bn) in non-military assistance to the Middle East. Mr Abe was speaking in Egypt at the start of his six-day tour of the region, which includes Jordan, Lebanon, Israel and the Palestinian territories. He pledged $200m (£130m) in non-military aid for countries fighting Islamic State, saying the world would suffer if terrorism spread. Japan relies on the Middle East for much of its crude oil imports. "It goes without saying that the stability of the Middle East is the foundation for peace and prosperity for the world, and of course for Japan," Mr Abe said at a meeting of the Japan-Egypt Business Committee in Cairo. "Should we leave terrorism or weapons of mass destruction to spread in this region, the loss imparted upon the international community would be immeasurable," he added. He said that Japan would provide infrastructure and humanitarian assistance to the region, including support for countries hosting refugees from Iraq and Syria. 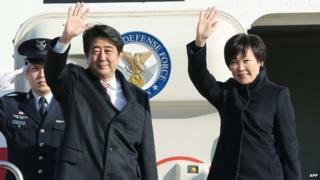 Mr Abe will meet Egyptian President Abdul Fattah al-Sisi before heading to Jordan. The Islamic State (IS) militant group has seized large areas of Iraq and Syria, where it declared the creation of a caliphate last year. It controls several oil fields and refineries in the area. The oil supplies are thought to generate an estimated $2m (£1.2m) in daily revenue for the group. IS's brutal tactics - including mass killings and abductions of members of religious and ethnic minorities - have sparked outrage across the world and prompted a US-led military intervention.